The Mazda6 was marketed as the first example of the company's Stylish, Insightful, and Spirited design philosophy followed by the Mazda2 in December 2002, the RX-8 in August 2003, the Mazda3 in January 2004, the Mazda5 in the summer of 2005, the MX-5 in October 2005, and the CX-7 in November 2006. The 2003 Mazda6 is essentially the 6th generation Mazda 626 as the Mazda6 continues on the G Platform, progressing from the GF-platform 626/Capella to the GG-platform Mazda6. The first generation Mazda6 was launched in Japan as the Mazda Atenza in May 2002. The model lineup consisted of a four-door sedan, a four door hatchback and a five-door wagon, marketed in North America as the "Sport Sedan", "5-Door" and "Sport Wagon", respectively. In Australia, the lineup was first available in Limited trim, as a sedan; in Classic trim as sedan, hatch or wagon and in Luxury trim as sedan and liftback — and Luxury Sports trim, as a liftback. In New Zealand the lineup consisted of 2.0L GLX (sedan only), 2.3L GSX (sedan, liftback, and wagon), and the 2.3L Limited (sedan and liftback). Its arrival in Japan signified a new consolidated approach as compared to previous large luxury sedans previously offered, such as the Mazda Sentia and the Mazda Millenia, as well as giving the Mazda Capella a refreshed appearance. The Atenza continues luxury car offerings to Japanese buyers due to dimensions placing it in the larger "normal size" classification, according to Japanese Government dimension regulations. In North America, the first generation was marketed as a 2003 model in the United States and as a 2004 model in Canada. In Europe, the luxury sports model was available as a 120 hp (89 kW) direct injection turbodiesel ("DITD") estate up until 2007. As of 2008, the European Mazda catalog lists only the "Sport" version of the 146 hp (109 kW) turbodiesel estate, while the "Luxury Sport" version has been dropped. Drivetrain combinations include the Mazda MZR engine in configurations of 1.8 L (L8-DE), 2.0 L (LF-VE) and 2.3 L (L3-VE), initially with a five-speed manual or four-speed automatic transmission (with sequential-automatic option, dubbed the "Four-Speed Sport AT"). In the US domestic market a 3.0 L Duratec 30 V6 engine is also available with a five-speed manual or five-speed automatic (with sequential-automatic option, dubbed the "5-Speed Sport AT"). European and Australian versions also feature a four-cylinder turbodiesel that comes with a six-speed manual transmission and produces significantly more torque than the V6, with much improved fuel economy. In North America, the 5-speed automatic optional on the V6 models is replaced by an Aisin 6-speed automatic for 2005 model year. The four-cylinder model receives a Jatco five-speed automatic in the following year. Power is directed to the front wheels in most markets, although full-time all-wheel-drive models are available in Japan, Europe and Australia. Not all configurations are available in all areas – for example, the Mazda 6 as released in Australia is available in 2.3L four-cylinder guise only, while the 626 which it replaced was available with a choice of four- or six-cylinder engines. The MZI V6 engine was only fitted to vehicles manufactured at Mazda's Flat Rock Assembly Plant and destined for the U.S. and Canadian domestic markets. Just as before the Mazda 626 was renamed to Mazda6 Atenza, Ford continues to use the Mazda's G-series platform for the basis of a number of its CD3 platform coded vehicles, including the Ford Fusion, Mercury Milan, Lincoln Zephyr/MKZ, Lincoln MKX, and a range of SUVs and minivans. Ford also plans to offer a hybrid powertrain on the platform. The official Mazda chassis codes are GG (saloon/hatch) and GY (estate) series – following the 626/Capella in its GF/GW series. Mazda's Hofu Plant in Yamaguchi Prefecture, Japan produced the Mazda6 for international markets from February 2002 to August 2007. In North America, Mazda6 production was handled at the AutoAlliance International plant in Flat Rock, Michigan. The first Mazda 6 rolled off the AAI assembly line on October 1, 2002, one month after 626 production ended. There are also satellite plants building Mazda 6 models in China and Thailand for their respective local markets. In September 2005, all Australian Mazda 6s received a facelift which included a feature upgrade, 5-speed auto and 6-speed manual transmissions, standard 16- or 17-inch alloy wheels and minor bodywork upgrades. In China, the Mazda6 was introduced by FAW Mazda in 2003. Despite the release of its successors, the first generation car, known locally as the Maliu (马六, "Horse 6"), continues to be manufactured at FAW's Changchun plant, having sold over 770,000 units as of 2014. This model is also used as the base for the FAW Benteng, also known as Besturn B70 or Hongqi C301. The 2006 Mazdaspeed Atenza (known as Mazdaspeed6 in North America and Mazda6 MPS in Europe, South Africa and Australia) is a high-performance version of the Mazda6. Its mission statement was written with the help of Peter Birtwhistle, chief of Mazda's advanced design studio in Germany at the time. It was initially unveiled as a concept at the 2002 Paris show. It features a turbocharged version of the 2.3 L MZR I4 which produces 272 PS (200 kW) (European version is detuned to 260 PS (191 kW); the North American version, at 274 hp (204 kW), revised to 270 hp (200 kW) for 2007). All models have 280 lb⋅ft (380 N⋅m) of torque. This 2.3 L DISI turbocharged engine features direct fuel injection and conforms to the new Euro 5 emissions standards. It has a revised front fascia with a raised hood, a 6-speed manual transmission, and all-wheel drive. The all-wheel-drive system uses Mazda's Active Torque Split computer-based control, which routes up to 100% of the power to the front or rear wheels depending on driving conditions. Originally scheduled to be launched in June 2005, the Mazdaspeed Atenza was delayed until November. In North America, the Mazdaspeed6 comes in two trim levels; the "Sport" trim with cloth interior and standard key entry and ignition; and the "Grand Touring" trim with leather interior, keyless entry/ignition, and an optional DVD navigation. Automatic climate control is standard, as is a 200 W Bose stereo system featuring seven speakers and a 9-inch subwoofer in addition to an in-dash six-disc CD changer. A sunroof with moonroof feature is optional on the Grand Touring trim. Car and Driver magazine has achieved a 0–60 mph time of 5.4 seconds for this vehicle. The Mazda6 was second place in the 2003 European Car of the Year awards and made Car and Driver magazine's Ten Best list for 2003. The Sport Wagon won the Canadian Car of the Year Best New Station Wagon award, while the Sport sedan won the Canadian Car of the Year Best New Family Car award for 2005. The Atenza Wagon also won What Car? 's Best Estate award in 2004. Also the Mazda6 won the 2003 Semperit Irish Car of the Year. The second generation Mazda6 made its premiere at the 2007 Frankfurt Auto Show in September. The new Mazda6 is based on the Mazda GH chassis platform, a revised version of the GG chassis which Ford also still uses as their CD3 platform. Mazda continues to provide three body styles, including 4-door saloon (sedan), 5-door hatchback and wagon. A number of journalists have already praised its electrically assisted steering for being considerably improved compared to the previous generation, providing more feedback to the driver. The hatchback model even has a trunk space which beats the larger rival Ford Mondeo and Opel/Vauxhall Insignia (hatchback) by 200 liters with rear seats folded down. This model of the Mazda6 was awarded 2010 Family Car of the Year by What Car? magazine. In China, over 680,000 Mazdas, including Mazda6 made between September 2008 and January 2016, were recalled due to faulty air bags. An earlier recall involved 280,000 Mazda6 models made between 2003 and 2008 for a similar issue. The recall was issued the same day the Chinese peak quality watchdog requested General Motors, Mercedes-Benz and Volkswagen recall vehicles with faulty air bags in China. The North American version was redesigned for the 2009 model year, with the wagon version being dropped there. It is a widened and lengthened version of the model sold elsewhere, with larger engines. Reviewers have noted its coupe-like roofline and sportier style. North American engine choices include a new 2.5-liter 4-cylinder and North American versions get the 3.7-liter V6 which is also available in the Mazda CX-9. Motor Trend recorded a 0–60 mph acceleration time of 6.1 seconds for the Mazda 6 V6. In America, only a sedan model was available (In Middle East, USDM Mazda 6 known as Mazda 6 Ultra is sold alongside the JDM Mazda 6). A Mazdaspeed 6 variant was not offered. Despite the North American version's increase in dimensions, Mazda maintains that the 6 retains the overall driving experience is still sportier than rivaling Honda Accords, Toyota Camrys, or Chevrolet Malibus. Early reviews have been favorable. On March 3, 2011, around 50,000 Mazda6 vehicles from the 2009–10 model years were recalled in the United States, with another 15,000 in Canada, Mexico and Puerto Rico after it was found that Yellow Sac Spiders were building nests in the fuel line of the vehicles. The Mazda6 has two pipes coming from its gas tank, an extremely rare configuration. The amount of gasoline vapor in the fuel line is just strong enough to draw the spider in but not strong enough to kill it. On April 5, 2014, Mazda reissued the same recall for spiders against all 2010–2012 Mazda6 vehicles with 2.5 liter engines. The last Mazda 6 rolled off the line on Friday, August 24, 2012, with Mazda discontinuing production on American soil, effectively ending the 20 year joint-venture between Mazda and Ford. Mazda moved production of the Mazda 6 back to the Hofu factory in Japan. In 2007, Mazda won its first manufacturers championship in the Touring Car class. In 2009, they finished 2nd in the manufacturer's championship with 65 points, behind Acura. The Mazda 6 has also been used in the KONI Challenge Series Sport Touring class. It was last used in 2008 by the Baglieracing team with Dennis Baglier, Chris Gleason, and Marty Luffy as drivers. The Mazda 6 also gives its name to a stock car in the NASCAR Corona Series. The third generation Mazda6 sedan was unveiled during Moscow International Automobile Salon on 29 August 2012, and the station wagon version followed during the 2012 Paris Motor Show in the following month. In this generation, there are only 4-door sedan and 5-door station wagon versions available. The wagon is no longer offered in the North American market due to low demand for wagon models. Mazda is not alone in pulling their wagon variants from the North American market, as Volkswagen, BMW, Audi, and Mercedes-Benz have removed at least some or all of their wagon models from their North American lineup — the currently-sold (2016) VW Golf Sportwagen is an exception to the drought of import station wagon availability in North America. Its design has been extremely well-received, and was a finalist in the "2013 World Design Of The Year". The Japanese-market Mazda Atenza went on sale from 1 November 2012. Early models include 20S (sedan/wagon), 25S (sedan/wagon), XD (sedan/wagon), XD L-package (sedan/wagon). For 2014, the changes include SCBS (smart city brake support) become standard for the Atenza 20S and XD, increased efficiency for SKYACTIV-G 2.5 engine models to 16.0 km/L (JC08 mode), new slide glass sunroof option for SKYACTIV-D 2.2 engine models, addition of XD L-package (6-speed manual transmission, leather seats), Bose 11-speaker sound system with Centerpoint 2 surround sound become standard in XD L-package models, addition of deep crystal blue mica body colour to total of 7 body colour options. In China, the third generation is sold under the Atenza nameplate, to differentiate it from the first generation Mazda6, which is still being produced in China. In the Philippines as Mazda's local distributor, Berjaya Auto Philippines has unveiled the all-new, third generation Mazda6 sedan are went on-sale by the end of 2013 as a 2014 model year, and followed by a 5-door station wagon variant, the Mazda6 Sports Wagon in late 2014 for 2015 model year (for gasoline engines in 2015 and a diesel engine for 2016 to 2018). In October 2018, Mazda Philippines has revealed the newly-refreshed Mazda6 sedan and wagon (for diesel and gasoline variants) during the 7th Philippine International Motor Show on October 24 to 28. Atenza Sedan design concept 2014 is a version of Mazda Atenza Sedan with SKYACTIV-D engine, SKYACTIV-MT 6-speed transmission, original aero parts, BREMBO brake caliper, Soul red body colour, roof, aluminium wheel, aero parts; semi-bucket seat, Alcantara interior upholstery. Atenza Wagon design concept 2014 is a version of Mazda Atenza Wagon with SKYACTIV-D engine, SKYACTIV-MT 6-speed transmission, metal decoration at instrument panel, dashboard with leather upholstery and stitching, metal decoration at trunk board. The vehicles were unveiled in 2014 Tokyo Auto Salon. In Australia and New Zealand, the Mazda6 is sold with a 2.5L SkyActiv-G petrol four-cylinder engine producing 138 kW (185 hp) and 250 N⋅m (180 lb⋅ft), a turbocharged 2.5L SkyActiv-G petrol four-cylinder engine producing 170 kW and 420 nm, or a 2.2L SkyActiv-D twin-turbo diesel four-cylinder engine producing 129 kW (173 hp) and 420 N⋅m (310 lb⋅ft). The 5-door hatchback version of the first and second generation models is no longer available, in favour of sedan (in Sport, Touring, GT and Atenza trim) and wagon (Sport, Touring, GT and Atenza trim). The only available transmission is Mazda's 6-speed SkyActiv automatic. Notably, Mazda's SkyActiv technologies have reduced the petrol model's fuel consumption from an official figure of 8.9 L/100 km (26.4 mpg‑US) (5-speed auto) for the previous generation to 6.6 L/100 km (35.6 mpg‑US), a 25% improvement. The diesel's fuel economy gain was less marked, from 5.9 L/100 km (39.9 mpg‑US) for the previous manual transmission-only diesel model to 5.4 L/100 km (43.6 mpg‑US) for the new automatic-only offering. The vehicle was unveiled at 2013 Los Angeles Auto Show as a 2014 model. North American SKYACTIV-G 2.5-liter gasoline engine models were set to go on sale in January 2013 as 2014 model year vehicle, followed by SKYACTIV-D engine models in second half of 2013. However the introduction of the diesel variant of Mazda6 to the U.S. market was delayed from the second half of 2013 to spring 2014 due to emission issue. In early 2014, it is reported that the introduction of the diesel engine has been delayed again, effectively cancelling the program for at least this generation of the model. The engine is already available on both the Asian and European models of the third generation Mazda6. Notably, the North American models are no longer offered with a V6 engine putting the model at a disadvantage. The 2.5 L produces 184 hp (137 kW) and has an EPA rating of 26 mpg‑US (9.0 L/100 km; 31 mpg‑imp) City and 38 mpg‑US (6.2 L/100 km; 46 mpg‑imp) Highway (with the 6-speed automatic). The Sport and Touring models are offered with the choice of either a 6-speed manual or 6-speed automatic transmission, while the top-of-the-line Grand Touring is only offered with a 6-speed automatic. In Canada, GX, GS and GT trim levels are offered and all have a 6-speed manual transmission standard. The North American 2014 Mazda6 won a Motor Trend comparison against the 2013 Honda Accord Sport and 2013 Toyota Camry SE. The 2014 Mazda6 Grand Touring also won in a comparison against the 2013 Honda Accord EX-L in the June 2013 issue of Car and Driver. The 2014 Mazda6 was unveiled in 2013 Toronto Auto Show (2014 Mazda6 Skyactiv-D Clean Diesel). Additional in the North American 2014 Mazda6 Grand Touring trim with Technology Package and Advanced Package were features such as Radar Cruise Control, Forward Obstruction Warning, Lane Departure Warning System and automatic High Beam Control. The North American 2015 Mazda6 was named a Top Safety Pick Plus by the IIHS when equipped with available Smart City Brake Support. The North American 2015 Mazda6 was named as a 2015 Car and Driver 10 Best pick, a "rare car that looks like it drives and drives like it looks." The North American 2016 Mazda6 Grand Touring trim introduced LED Headlights in lieu of bi-xenon HID headlights, new LED daytime running lights and LED foglights. The North American 2016 Mazda6 Grand Touring trim with Technology Package also introduced Smart Brake Support (SBS) which is different than Smart City Brake Support (SCBS) which was introduced in earlier Mazda models such as the CX-5. Although the two systems are similarly named, they perform different functions at different speed ranges. Smart City Brake Support uses a windshield mounted laser that measures the distance to a car in front, works with car braking systems at speeds below 19 mph (30 km/h) to avoid or reduce the severity of a rear-end collision. If the SCBS laser detects imminent collision conditions, the braking system is prepared to deliver full stopping power, the engine speed is reduced, and if necessary, brakes are applied. The similarly named Smart Brake Support uses a millimeter wave radar to measure distances to the next car as far as 200 m (656.2 ft) ahead, at speeds up to 90 mph (145 km/h). The SBS radar inputs can be used for adaptive cruise control inputs to allow for safe following distances using cruise control throttle and brake inputs, and in the event of a potential collision, SBS can apply brakes and slow the car for collision avoidance or collision severity mitigation. In all instances, the driver is given audible and visual warnings when either SCBS or SBS are activated. The systems only take over if no driver response is detected. Production of all North American models was transferred to Hofu, Japan, due to ongoing efforts to increase global manufacturing efficiencies. The North American 2014 Mazda6 Grand Touring trim with Technology Package introduced the Mazda i-ELOOP (intelligent-Energy Loop) technology. i-ELOOP is a unique regenerative engine braking system that uses the free wheeling alternator to capture energy when you lift your foot off the accelerator. The captured energy is stored in a capacitor, and that stored energy is then used to power the car's electrical components—from the AC to the power steering—and in turn, improves real–world fuel efficiency by as much as 5 percent. The i-ELOOP equipped cars, which also use active grill shutters at highway speeds, claim an EPA mileage rating of 28 mpg‑US (8.4 L/100 km; 34 mpg‑imp) City/40 mpg‑US (5.9 L/100 km; 48 mpg‑imp) Highway, 2 mpg better EPA mileage ratings than the standard gasoline engine Mazda6 with 26/38. The significance of the capacitor system is that the capacitor can store in seconds enough energy to run the car electronics for about several minutes. The capacitor system offers large weight and space savings over batteries. i-ELOOP also achieves better gas mileage by disengaging the energy sapping alternator during acceleration, i-ELOOP is an innovative use of existing alternator waste energy in deceleration mode, which can happen more frequently than regenerative braking, common in hybrid cars. i-ELOOP is representative of the "different" thinking applied by Mazda engineers to age old problems. While not the case now, it is possible that this type capacitor technology could become part of a suite of energy saving tools used in any type of car, electric, hybrid, etc., similar to the engine stop start technologies that are widely applied in cars today. The newly-facelifted 2018 Mazda6 was unveiled in November 2017 at the 2017 Los Angeles Auto Show in Los Angeles, California. Changes to the 2018 Mazda6 include new front and rear fascias, new aluminum-alloy wheel designs, standard i-Activsense driver assistance technologies on all Mazda6 trim levels, new interior fabrics and upholsteries, and the restructuring of trim levels, which are the preexisting Sport, Touring, Grand Touring, as well as new Grand Touring Reserve, and Signature. While base Sport and Touring trims receive the standard and previously-available 187-horsepower, 2.5L SkyActiv Inline Four-Cylinder (I4) gasoline engine, uplevel Grand Touring, Grand Touring Reserve, and Signature trims receive a 2.5L SkyActiv Turbocharged Inline Four-Cylinder (I4) gasoline engine that produces 227 horsepower (250 horsepower on high octane fuel). A six-speed automatic transmission is standard on all trim levels except the base Sport trim, though a six-speed manual transmission remains available only on the base Sport trim level, with the aforementioned six-speed automatic transmission being optional equipment. A diesel engine for the North American market has not yet been announced for the Mazda6, though has been announced for the 2018 Mazda CX-5 compact crossover SUV. Pricing for the 2018 Mazda6 starts at $21,950 for a base Sport, while the top-of-the-line 2018 Mazda6 Signature sells for $34,750. As with the pre-facelift model, the facelifted Mazda6 continues to be produced at Mazda's assembly plant in Hiroshima, Japan. Mazda has also announced that the 2018 Mazda6 will be its first vehicle to receive both Apple CarPlay and Android Auto. A software update will become available for 2018 Mazda6 owners that adds these capabilities, and new Mazda6 models produced after a certain date will be equipped with these features from the factory. Though it has been released in most markets, Mazda has not yet announced when Apple CarPlay and Android Auto will become available in their North American markets. The manual transmission was discontinued for the 2019 model year, however Mazda has hinted that it might be available as a special-order option in the future. In 2013, Mazda entered the new GX class of the Rolex 24 series with cars powered by its diesel Skyactiv-D engine. During the first race in January 2013, all three cars had to retire in the first few hours due to engine failure. The Mazda6 is also presently used as a racing vehicle for the GTS class at SCCA Pro Racing World Challenge. Mazda finished first in the manufacturer's championship standings. Mazda6 drivers also finished first and second in the Touring Car driver points. 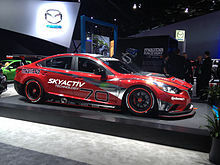 It is a race car version of Mazda6 for the GX class of Grand-Am series, with 2.2L SKYACTIV-D engine. The vehicle was unveiled at 2014 Tokyo Auto Salon (race champion model). ^ Neff, John (2006-03-17). "autoblog.com". autoblog.com. Retrieved 2009-04-18. ^ a b Nakamura, Yu (2014-12-08). "11 years on, Mazda6 still pulling them in". Nikkei. Retrieved 2014-12-16. ^ 《高木啓》 (2001-10-18). "【東京シヨー2001出品車】マツダ『アテンザ』-世界一のデザイン | レスポンス". Response.jp. Retrieved 2017-01-16. ^ "Major production facilities in Japan". Archived from the original on 2010-12-29. ^ "2007 Mazdaspeed 6 – Feature". Car and Driver. Retrieved 2010-10-19. ^ "Mazda 6 Overview". Edmunds.com. Retrieved 2009-04-18. ^ "canadiandriver.com". canadiandriver.com. 2008-07-28. Retrieved 2009-04-18. ^ Spinelli, Mike (2007-09-06). "jalopnik.com". jalopnik.com. Retrieved 2009-04-18. ^ km77.com. "km77.com". km77.com. Retrieved 2009-04-18. ^ a b "China's FAW to recall 680,000 more Mazda cars over faulty Takata airbags". Reuters. 8 Jul 2017. Retrieved 8 July 2017. ^ Henry, Jim. "industry.bnet.com". industry.bnet.com. Retrieved 2009-04-18. ^ "auto123.com". auto123.com. 2008-07-24. Retrieved 2009-04-18. ^ "wheels.ca". wheels.ca. 2008-07-26. Retrieved 2009-04-18. ^ "2009 Mazda Mazda6". Autoblog.com. ^ "2009 Mazda 6 vs. 2008 Honda Accord vs. 2008 Nissan Altima". Edmunds.com. 2008-09-07. Retrieved 2009-04-18. ^ "Spider web fire risk prompts Mazda6 recall". BBC News. 2011-03-04. ^ Valdes-Dapena, Peter (2011-03-03). "Spiders lead to Mazda recall". CNN. ^ "Spider causes Mazda6 sedan recalls for second time in three years" New Jersey On-Line LLC. 05 April 2014. Last accessed 05 April 2014. ^ "Gas-loving spider prompts Mazda recall in U.S." Thomson Reuters. 04 Mar 2011. Last accessed 16 May 2001. ^ "SCCA Pro Racing SPEED World Challenge – Series History". World-challenge.com. Archived from the original on 2009-04-10. Retrieved 2009-04-18. ^ "SCCA Pro Racing SPEED World Challenge – Points". World-challenge.com. Archived from the original on May 18, 2008. Retrieved 2009-04-18. ^ "Event Entry List". Grand-am.com. 2008-02-25. Archived from the original on December 20, 2008. Retrieved 2009-04-18. ^ "Mazda de México participará en la NASCAR Corona Series". Portal Automotriz. April 9, 2010. ^ "Mazda 6 Now Assembled in Vladivostok". Wroom.ru. 12 April 2013. Retrieved 18 April 2013. ^ MacKenzie, Angus (February 2013). "On With The Game". Motor Trend. 65 (2): 77. ^ "Nicht schlecht, aber auch nicht perfekt. – Das sagt Mazda-Designer Akira Tamatani zu unserem Entwurf eines MX-5-Nachfolgers – Mazda: Mit Kodo-Design zu schicken Autos – Auto". Auto.ch.msn.com. 2014-12-16. Retrieved 2017-01-16. ^ "2013 World Car Awards" (Media Release). World Car Awards. 2013-01-31. Retrieved 2013-05-20. ^ "「マツダ アテンザ」を一部改良". Mazda.com. Retrieved 2017-01-16. ^ Name * (2013-07-10). "First generation Mazda 6 still going Strong in China | CarNewsChina.com – China Auto News". Carnewschina.com. Retrieved 2017-01-16. ^ a b "東京オートサロン2014にSKYACTIV技術をフル搭載し、魂動デザインのスポーツイメージをより強化し、「走る歓び」を追求したコンセプトモデルを出品 －北米グランダムGXクラスのマニュファクチャラーチャンピオン獲得のMAZDA6を特別展示－". Mazda.com. 2013-12-25. Retrieved 2017-01-16. ^ "Specification & Prices | New Mazda6". Mazda.com.au. 2017-01-05. Retrieved 2017-01-16. ^ James R. Healey, USA TODAY. "Mazda delays U.S. diesel until late next spring". Usatoday.com. Retrieved 2017-01-16. ^ "Mazda Delays Skyactiv-D Diesel Engine Again for U.S. – News – Car and Driver | Car and Driver Blog". Blog.caranddriver.com. 2014-01-09. Retrieved 2017-01-16. ^ "Mazda6 specs in Canada". ^ "2013 Honda Accord Sport vs. Toyota Camry SE vs. 2014 Mazda6 Grand Touring". 2013-03-28. ^ "2014 Mazda 6 Grand Touring vs. 2013 Honda Accord EX-L – Comparison Test – Car and Driver". Caranddriver.com. 2014-02-20. Retrieved 2017-01-16. ^ "2014 Mazda6 Skyactiv-D Clean Diesel takes aim at Passat TDI during Toronto Auto Show debut". Ca.autoblog.com. Archived from the original on 2014-06-02. Retrieved 2017-01-16. ^ "Vehicle details". Iihs.org. 1999-02-22. Retrieved 2017-01-16. ^ "Mazda 6: 2015 10Best Cars – Feature – Car and Driver". Caranddriver.com. 2014-11-19. Retrieved 2017-01-16. ^ a b "SCBS & SBS | Pre-Crash Safety Technology". MAZDA. Retrieved 2017-01-16. ^ "MAZDA:Next Midsize Car for North America To Be Built in Hofu, Japan". 2011-06-07. ^ "Brake Energy Regeneration System | Environmental Technology". MAZDA. Retrieved 2017-01-16. ^ a b Bengt Halvorson. "Mazda Improves Fuel-Saving Start-Stop System With Capacitors". Greencarreports.com. Retrieved 2017-01-16. ^ "2018 Mazda 6 Turbocharged Sports Sedan – Mid Size Cars - Mazda USA". www.mazdausa.com. ^ Capparella (29 March 2019). "The Manual-Transmission Mazda 6 Is No More for 2019, but It May Not Be Gone for Good". Car and Driver. Retrieved 29 March 2019. ^ "Mazda6 diesel to race at Rolex 24, team and drivers announced". Ca.autoblog.com. Archived from the original on 2014-06-25. Retrieved 2017-01-16. ^ "Mazda motorsports races diesel Skyactiv-D cars in Rolex 24 at Daytona – SlashGear". Slashgear.com. Retrieved 2017-01-16. ^ Condon, Josh (May 2015). "The Short, Brutal Life of a Racing Piston". Road & Track. 66 (8): 84. ^ "Mazda races diesel-powered sedans in Rolex 24 retires early – MSN Autos". Editorial.autos.msn.com. 2017-01-04. Retrieved 2017-01-16. ^ "Mazda Canada Sets Sales Record In December". Mazda News. Retrieved 2018-03-08. ^ "Mazda Canada announces sales for December 2012 and full year". Mazda News. Retrieved 2018-03-08. ^ "Mazda Canada reports sales for December and 2013 full-year". Mazda News. Retrieved 2018-03-08. ^ "Mazda Canada Reports Sales for December and 2014 Full-Year". Mazda News. Retrieved 2018-03-08. ^ "Mazda Canada reports sales for December and full-year 2015". Mazda News. Retrieved 2018-03-08. ^ "Mazda Canada reports sales for December and full-year 2016". Mazda News. Retrieved 2018-03-08. ^ "Mazda Canada Reports Sales For December and Full-Year 2017". Mazda News. Retrieved 2018-03-08. Wikimedia Commons has media related to Mazda6 and Mazda Atenza.